Attractive, Epoxy Coated Die-Cast Metal Body Folding Pocket Knife. Simple Spring Mechanism Enables ..
Straight Blade with Special Sharpening. Repaceable. Hinged Blade Guard, Integrated in the Handle, C.. 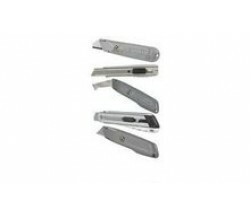 Heavy Duty Metal Body 5 Position Slide 3 Spare Blades..
Kamasa Blade Protector & Pouch Included.. Suitable for 5900, 10-595 and 10-598 knives. Straight, general purpose, light-duty blade for mode..
Press and flip one-handed opening provides fast access to the blade. Tool-free blade change allow.. Ideal for opening cartons without tearing contents. Blade has rounded ends Ideal safety blade.. The Stanley original retractable blade knife is made from grey painted die-cast metal body, which is..
A 1992B heavy-duty blade with rounded safety tips - it is ideal for opening cartons without tearing ..
Easy snap off blade provides new cutting tip Heavy duty steel construction Blade lock feature Erg.. The Stanley 10-189 springback safety knife has a red high visibility body which is ribbed to provide.. The Stanley STA010499 Retractable Knife accepts most Stanley blades, including: 1992 (11-921, 11-9..
Comes with Case & 3 Blades.. Supplied in Case with 3 Blades..